Technological progress sets the pace for important changes that are both social and economic, making technological a fundamental element for Euskadi's development, and therefore for vocational training. 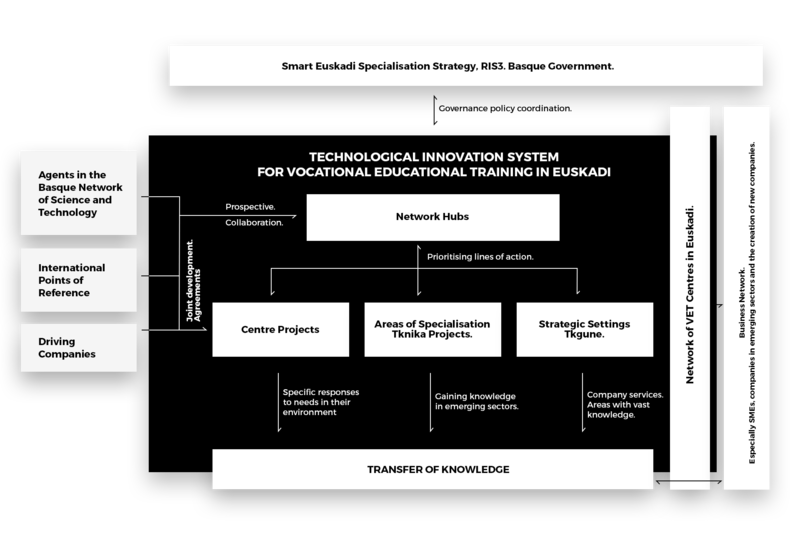 In this regard, the objective of Tknika’s Department of Applied Innovation within the scope of Vocational Training is to reduce the time that passes between when a new technology arises until Basque society benefits from it, and to research technologies to develop new market niches in Euskadi. To this end, we designed the Euskadi Vocational Training Technological Innovation System, which seeks to support society and especially SMEs in the challenge posed by competing for high added value. Said system is based on the Basque Government’s Specialisation Policies, which establish priorities, and is rolled out under the Basque Vocational Training Plan through Tknika and vocational training centres. The procedure for the aforementioned priorities takes place at Tknika and begins with an initiative surveillance, prioritisation and selection process, which are then carried out through different programmes, and then ends by transferring them to rest of vocational training centres and SMEs. In addition to the initiatives included in the Euskadi Vocational Training Technological Innovation System, Tknika also works at ELKARNET, whose client are the centres. At ELKARNET, we take care of updating, maintaining and optimising systems, the centres’ connectivity and IT infrastructures, so that they can fully optimise and use the possibilities that they offer. 1 - SMART SPECIALISATION STRATEGY. BASQUE GOVERMENT. Vocational training makes sense based on its alignment with Basque Government policies and with the priorities that it establishes within the framework of smart specialisation. To this end, besides keeping watch over and knowing said policies, Tknika applies them when prioritising the projects to be worked on. Euskadi’s vocational training is a fundamental agent, acknowledged in different scopes (companies, Government, European classes…), so that, represented by Tknika, Euskadi’s vocational training participates in initiatives oriented toward giving shape to, and rolling out innovation policies. Placing focus on trailblazing companies in the community, with sights set on future needs that imply challenges, the hubs identify and prioritise necessary differential capabilities. To this end, we coordinate with reference-point companies in Euskadi that help us to identify said capabilities, and we propose initiatives and projects to be carried out. 2.- Digital and connected factory. Drawing support from the capability and experience of centres in developing projects and the knowledge surrounding them, we develop projects designed to meet their environmental needs, as well as the needs of innovation itself. Tknika participates in selecting projects to be developed from the centres, and we take charge of monitoring them, as well as of guaranteeing all of their transfer objectives. In addition to proposing the projects to be carried out on an annual basis, the centres are responsible for executing them and their roll-out. We carry out projects with the intent of creating knowledge and training ourselves in areas highlighted as priority by Basque Government policies, where we find insufficient knowledge at our vocational training centres to provide the services that the industry requires or will require. In order to support innovation at SMEs, we seek to make capabilities and knowledge that already exist at the Vocational Education and Training centres system available to them, by providing services. Integration of different technologies forming Industry 4.0 in mechanical manufacturing workshops, where students are the users. Interoperability and connectivity in Industry 4.0. Advancing towards intelligent factories. Applying Virtual Reality in training. Development of Additive Manufacturing Technologies and their implementation through VET centres. Integration of new Automotive technologies in VET. Technological services to enable a transfer of knowledge between VET and SMEs. Acquire knowledge in the field of offshore renewable energy, with the aim of defining the skills it will require. Detect care needs that could be met using technological resources and provide solutions within the scope of VET.